NickLannon.com: Who Runs Toward an Injury? 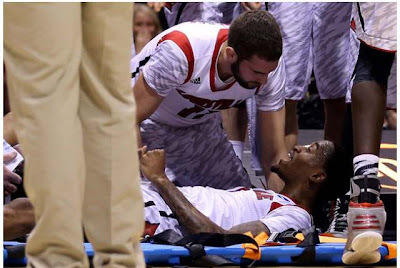 But after turning his head with everyone else at the sight of the snapped bone, Luke Hancock was the one who came to Ware's side and gripped his hand. He said a prayer, guided him through the initial trauma, and stayed with him on the floor while the medical staff worked. It was because of Hancock, at least in part, that Ware overcame his initial horror and encouraged his teammates to keep playing, to win the game. In the days leading up to Louisville's Final Four game against Wichita State, the question Hancock faced over and over was why he'd done it. Why did he have the presence of mind to react the way he did? When he answered the question Friday in the Georgia Dome's media center, he probably could have recited a response from memory. He'd been the centerpiece of hundreds of stories for that one act, and was destined to be featured in a hundred more. Which is why it surprised me that his answer, simple as it was, still moved me. "You know, I don't really know why I went out there," he said. "But, you know, I just didn't want him to be alone out there. I don't know." Hancock, by some miracle (note that he says, even after having days to think about it, that he doesn't know why he went to Ware's side), was moved to go toward the grisly injury, rather than away from it. Though Luke Hancock is in no way Jesus Christ, this direction of movement is indeed Christlike. When the uninjured (righteous) goes toward the injured (unrighteous), miracles happen. When Christ comes toward us, even as we lie there, broken in sin, that miracle is our salvation.